I recently tidied my server filesystem and ended up making webroot a little more secure by keeping all of my source out of there, and having nothing that I edit directly in place. Mainly this was done to avoid duplication of backups. Okay, so you can never have enough backups, but I previously kept all of my development code in ~/Development which was being backed up as well as all being under version control with Assembla. It also meant I had a load of symlinks in webroot pointing at various trunks and branches and I’d never really liked the idea of that. 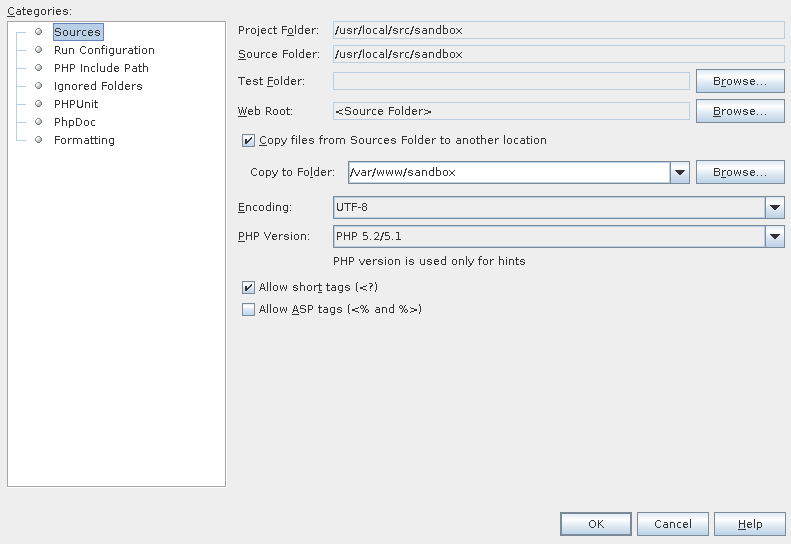 I create NetBeans projects with the project root at this location, and ‘Copy files form the Sources Folder to another location’ is ticked, and directed to a suitably named folder in webroot. Once this is created, it is ‘chown root:www-data’, and chmod ‘g+s’ with default permissions allowing the web server can write to logs and write any cache files that are used. And I’m added as a member of www-data group. After this, I create a new virtual host to the project in /etc/apache2/sites-available, an entry to /etc/hosts, a number of aliases so I can easily access various points of the project from the terminal, and usually add a bookmark to the Bookmarks Toolbar in Firefox for easy access. 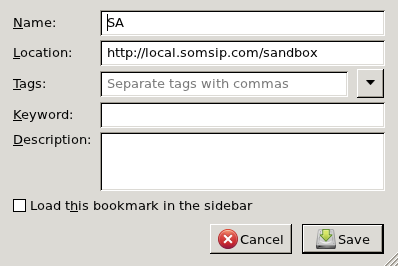 alias sandl="tail100 -n 100 -f /var/www/sandbox/logs/sandbox.log"
It seems complicated now I look at it again, and I’m happy to accept it might not be the best way. But it avoids a large amount of duplication in backups, still allows me to use xdebug in NetBeans, allows me to easily view logs and drop into the project webroot or source in a terminal if I need to. And as I prefer to use svn and git in CLI and not in NetBeans, this can be helpful. And it feels like a step in the right direction, so I’ll go with it for now.